Disassemble, when not riveted together. Polish the blade to remove any foreign matter. Check angle to ensure the proper sharpening angle is replaced in cutting blades. Sharpen each blade then hone to provide the best cutting edge. Lubricate the sliding surface under screw, reassemble and adjust the tension on the blades. 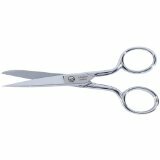 As each scissor or shear has an intended use, there is a different angle and method for servicing each one. We will service each for the intent it was designed. Example, paper scissors and beauty shears have different angles and although both will cut paper only the paper scissors will do so without damaging the cutting edge. We start by cleaning and polishing the blade surfaces. Note! Pitted surfaces from rust will not be returned to new condition. We only clean off the surface rust and do not grind the surface smooth. Next we check for cracks and missing or broken teeth. On hand saws we are able to cut new teeth on the saw to remedy this condition. 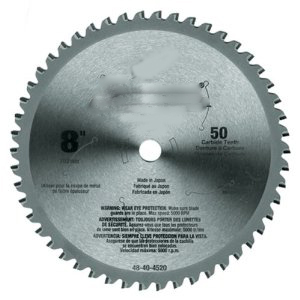 On circular saw blades this process will result in a smaller blade diameter. We then check for roundness of all circular saw blades. This is to ensure a true running blade in your equipment, saving wear on the bearings of the motor. Next we grind or file the teeth to the proper angle. The next step is to adjust the set of each tooth, giving the proper clearance necessary to prevent binding when cutting. On carbide tipped blades we sharpen the face and top of each tooth, and check the sides for proper clearance. When necessary we also touch up the sides to make each tooth the same size giving better cut and control. At this time we do not replace the carbide tips. Each blade gets cleaned of rust and grass buildup. Next we inspect for cracks and deep nicks from stone and tree branches. The third step is to check the balance, to see if removal of nicks can be done without destroying the blade. We then grind the cutting surface bringing the edge to that of a butter knife. Any sharper the blade will need to be serviced sooner. We again check the balance to ensure both side of the blade are equal. This helps eliminate excessive vibration in the mower preventing damage to the engine shaft, as well as the possibility of the bolt holding the blade snapping off causing injury. On the reel style lawn mowers, we grind each blade equally along with the draw plate. After this we adjust the plate to give the proper clearance of each blade allowing the grass to be cut instead of torn. Finally we lubricated the drive on those without the enclosed system to make it easier to push the mower through the lawn. 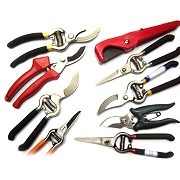 We start by disassembling the pruning shears. Then we clean all the parts of rust and sap. Next we look for problem areas in the blade, cracks or weak areas. Next we sharpen and hone the cutting edges returning the angle to manufacturer specifications. This gives a razor like edge to the cutting surface allowing it to cut the smaller limbs and vegetation without tearing it. Providing less stress to the plant being pruned. During the reassembly we lubricate the surfaces that slide together giving a smooth glide to the pruners. This is the same process used for hedge shears. 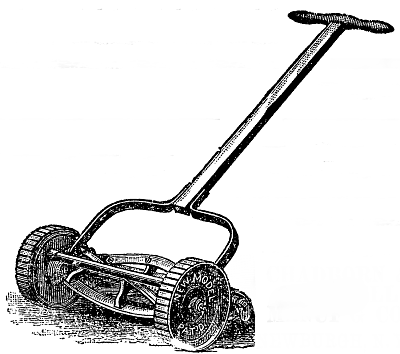 On shovels, hoes, axes, hatchets and other tools used in the yard, we do not take them apart. We do clean them and check the cutting edge. We then grind the cutting edge to make it easier to perform the task for which they were intended. Although we do not repaint these items, it is suggested that a coat of paint will help prevent them from rusting. A little car wax on the shovels will also help in the use. We check for damage to the blade and sharpen and hone each knife according to the angle present, unless asked for something different by the customer. The honing process will leave a polished appearance on the cutting edge and ensure the blade is as sharp as it possibly can be. 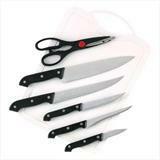 Although the there are different quality knives, most can be sharpened and will hold an edge. To help a knife stay sharp we recommend that it be hand washed instead of bounced around in a dishwasher. We also recommend that they be stored in a knife rack rather than a tray, preventing the blades from being bumped against others causing nicks. We do all knives from kitchen to pocket, and wood carving. The first step is to remove the knife from the base. We also remove the cutting block from the base. Next we clean any tape or residue left from cutting laminates. We check for deep gouges and nicks in the cutting surface. Then we sharpen the cutting edge as well as the cutting block. This will give a sharp edge on both surfaces. Our next step is to reassemble the cutter, and adjust the tension between the movable knife and the stationary block. When finished we test the cutter to see how many sheets of paper or tag board can be cut leaving a smooth cut edge. This is then relayed to the customer. Sorry, at this time we do not have the proper set ups for doing rotary blade cutters. Does your business use tools and equipment that dulls over time? --Of course it does! ZoSharp has the experience and professional skills to help keep your business at its sharpest. We can custom tailor a occurring sharpening schedule with your business to keep your employees and equipment at their best. Please contact us for more information about how we can keep your business sharp. While we handle many types of sharpening, we couldn't possibly handle everything. Please call us if your sharpening needs are not found on our site. No Problem! In response to our sharpening demand, ZoSharp accepts small items to be mailed to our business address listed on our website. We are always happy to serve our customers, either in person or by mail for those who are further away. Is your business interested in offering professional sharpening services, but you don't have the ability to do it in-house? Please contact us to learn more about how ZoSharp can work with you to add professional sharpening to your business' list of service offerings. We are currently accepting new affiliates and partnerships. Ideal candidates include hardware stores, lawn and garden centers, and machine shops.